I hope you are all well and having a nice week. 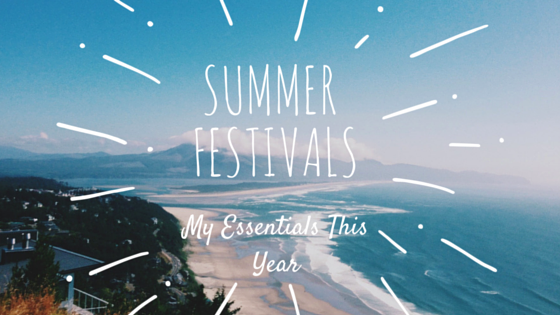 Today we are going to be talking about summer music festivals! I did a series last year sharing some of my top picks on fashion, footwear and other bits and bobs which hopefully I'm going to do again this year. Today's post is going to be a super quick checklist on some of the key things that I will be taking with me this year and that hopefully you will find useful. First of all, this year I will be taking multiple portable phone charging banks. My phone is an absolute nightmare when it comes to rinsing the battery and I want to make sure I can get hold of my friends at all times and also be able to take photos on the go to share with you guys on Instagram! I'll be looking for ones that are lightweight and have a high storage capacity to make sure they last as long as possible. Next, I'll be taking a sturdy water bottle. There are always taps to fill up from and I want to make sure that I am hydrated throughout the day as when it's hot and you are doing loads of walking and dancing, it is really easy to start feeling a bit faint and dehydrated if you don't have enough liquid which can be really dangerous. I'll also be taking some fun fashion items, I'll have a minimum of one flower crown (probably more), some custom printed t-shirts for me and the girl gang to wear together and then nice jewellery such as personalised wristbands from https://www.welovewristbands.com/ where you can create your own designs and make them look really cool. This year I must remember to make sure I pack a more heavy duty fold up chair, the one I took last time was absolutely knackered after a few days and I want to get a proper metal frame camping style one as when you're sat around your tent chilling out, the last thing you want is a wobbly cheap one that you fear will collapse at any second (it didn't thankfully). Another good thing to take would be a supply of plastic carrier bags. I cannot even tell you how handy these come in for carrying food, dirty clothes or shoes, drinks, keeping stuff clean and meaning you can pack it all in your case without mixing everything in together. Take a good 5-10 and you wont regret it, they take up next to no space as well. I hope you found these useful, if you want to see a full festival checklist post tell me in the comments below and I can try and put something together.